Sukanto Tanoto established the Tanoto Foundation to alleviate poverty around the world through education, job training, and entrepreneurship initiatives. True to this mission, the Tanoto Foundation held a student entrepreneurship tutorial in conjunction with the Magister Management program in the Fakultas Ekonomi at the University of Indonesia in Jakarta. Entitled “Entrepreneurial Opportunities in e-Business,” the tutorial looked at ways of generating income on the Internet and using digital resources to launch and build companies. Anderson Tanoto, a member of the Tanoto Foundation’s Board of Trustees, opened the event by speaking of his father’s accomplishments. He noted that, in building the Royal Golden Eagle business group, Sukanto Tanoto embodied the idea of survival entrepreneurship, because he persevered with determination and never gave up, even in the face of great adversity. In addition, Anderson Tanoto explained that his father practiced growth entrepreneurship, which involved establishing good corporate governance principles and best practices while continually focusing on improvement. His example made clear that entrepreneurs succeed when they are motivated by a drive to create the best product or service available on the market. Entrepreneurship, however, involves more than drive and perseverance, Anderson Tanoto pointed out. True entrepreneurs must take calculated risks and recognize that failures happen. The important thing is to learn from these mistakes, rather than push them under the rug. Martin Hartono, director of business technology for the Djarum Group, also spoke at the event. He emphasized the importance of entrepreneurs understanding their own strengths and weaknesses and of finding a business partner that complements them well. In addition, he encouraged attendees to focus on the mission of their business as a source of motivation during difficult times. The third speaker, fashion designer and entrepreneur Anne Avantie, told aspiring entrepreneurs to keep learning throughout their careers and never to underestimate what another person can teach. Although she only completed junior high school, she continued her education outside of school and became an expert in her field. Over the course of her career, she has secured nearly a dozen contracts as a Miss Universe fashion designer. The son of distinguished Indonesian business leader Sukanto Tanoto, Anderson Tanoto took responsibility for his own career and secured a position with Bain & Company’s Singapore officer as a consultant at a young age. Since then, he has developed his own unique entrepreneurial style that has allowed him to realize success. A member of the Tanoto Foundation Board of Trustees, Anderson Tanoto maintains a dedication to giving back to the community. Recently, he spoke at a tutorial organized by the Tanoto Foundation in Jakarta to encourage and train new generations of entrepreneurs. 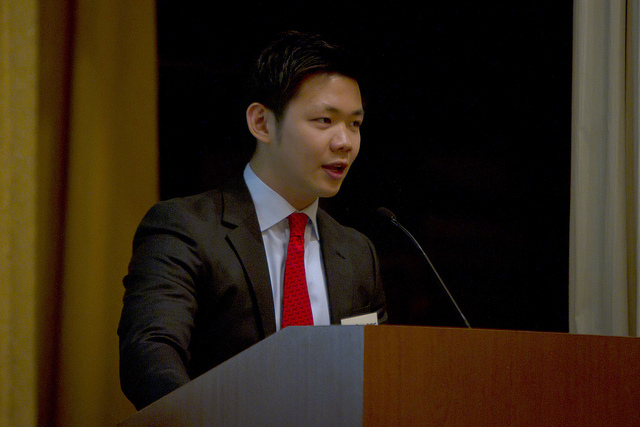 During this event, Anderson Tanoto discussed the entrepreneurial style of his father. At the Tanoto Entrepreneurship Series Event, Anderson Tanoto highlighted three key points for entrepreneurial success. These points are informed by his father’s successes and include lessons that he implemented to make his own achievements. The first principle of entrepreneurship is survival. Sukanto Tanoto began building his business empire, the Royal Golden Eagle group, at the age of 17, and he persevered with a spirit that taught him never to give up on his dreams. Even in the face of adversity, he believed in himself and continued to move forward, despite setbacks. The second principle emphasizes growth. For a company to succeed, it requires a solid infrastructure. Growth depends on a reliable core. Thus, entrepreneurs must focus a great deal of energy on developing systems marked by good governance and sound operational processes. When entrepreneurs pay constant attention to the larger business model, they can ensure that their company grows at a sustainable rate. Growth, of course, also depends on a great product. Entrepreneurs realize the most success when they aim to produce not just a good product or service, but one that is better than any other on the market. Thirdly, entrepreneurs must constantly look for new opportunities. Once a company has become established and has achieved stability, the entrepreneur can continue development by taking calculated risks. During this stage, entrepreneurs can and will fail, but these failures are excellent learning points. Because of this, entrepreneurs should see failure as a lesson, not a mark of shame. Given the looming risk of secular stagnation in many advanced economies, the emerging economies definitely feel the impact of the shift and should think of ways to overcome the problem. The slowing of global growth in advanced economies is largely owed to the adverse effect on productivity growth of years of underinvestment in human and physical capital. In addition to this, the structural reforms that these economies need to boost their potential growth are implemented too slowly. Indonesia has already felt some of the impact of this shift and even though corporations are still profitable, they face a much more challenging environment of rising costs, slowing exports and regulatory uncertainty. Anderson Tanoto was speaking at the signing ceremony of a program between the Tanoto Foundation and the Wharton School’s Global Initiatives. The program aims to promote greater education cooperation between the Wharton School and top Indonesian universities. The program will facilitate visits by faculty from Wharton to teach at Indonesian universities; provide scholarships and fellowships for Indonesians to study at Wharton; and fund research on Southeast Asia at Wharton. The long-term goal of the program, Tanoto noted, is to raise Indonesia’s human capital so the country can compete in a fast- changing global economic environment. Wharton, said Professor Harbir Singh, vice dean of the Global Initiatives program, has always excelled in leadership and hopes to help spark innovative ideas at Indonesian institutions of higher learning. “Good ideas can come from anywhere and our goal is to take those ideas to fruition.”Innovation and research are the primary pillars that will enable Indonesia to rise up the value chain and produce higher-end products to offset the country’s overreliance on commodity exports, noted Fauzi Ichsan, chief economist at Standard Chartered Bank Indonesia. Given this scenario, Indonesia must put its economic house in order fast. The government needs to accelerate reforms, build more infrastructures and improve the investment climate”. To do this, one of the most crucial factors is the human capital behind the nation. There must be a structured programme to groom leaders and entrepreneurs who are able to carry the burden of the nation’s economy. The grooming of the next generation is also crucial to ensure the continuity of innovation and creativity breakthroughs. This is why Tanoto Foundation believes that they have a responsibility to play in building up the next generation of entrepreneurs through education and partnership with existing successful institutions to bring out the potential in the young people of Indonesia. Tanoto Foundation worked with University of Indonesia to hold Tanoto Entrepreneurship Series 2013 with the theme ‘Entrepreneurs Innovative Behaviour and Business Success’. This event is to show suport to the Government’s effort in promoting entrepreneurial spirit and also to enhance the soft-skills of students in MM-FEUI programme. The event was officially opened by Anderson Tanoto who shared about the journey of his father, Sukanto Tanoto, and how he managed to achieve the success he has today. This Tanoto Entrepreneurship Series was specially designed by Tanoto Foundation with University of Indonesia and it is a dream come true for Sukanto Tanoto to prove that young people in Indonesia have the capabilities and potential to perform better than strong competitors all over the world. Yang terhormat Ibu Noni Purnomo, Bapak Dr. (Honoris Causa) Jusuf Kalla, Professor Rhenald Kasali, Dr. Ezni Balqiah serta semua teman-teman yang hadir dalam acara ini, selamat siang. Salam sejahtera untuk kita semua. Atas nama Tanoto Foundation dan keluarga Tanoto, saya ucapakan selamat datang pada acara kemitraan Tanoto Foundation dan MM-UI ini. Entrepreneurship sangat dekat di hati keluarga Tanoto. Bagi Tanoto Foundation, yang penting dalam entrepreneurship, adalah bagaimana memberdayakan manusia dengan pengetahuan, pengalaman dan pendidikan yang tepat agar dapat berhasil dalam menghadapi berbagai tantangan dalam bisnis yang mereka jalankan. Ayah saya, Sukanto Tanoto, berangkat dari kesederhanaan, dan beliau tidak memiliki kesempatan untuk mendapatkan pendidikan yang tepat. Sebagai anak tertua dari 7 bersaudara, baginya entrepreneurship adalah untuk survival (Entrepreneurship for Survival). Kami anak-anaknya di generasi sekarang, beruntung, karena kebutuhan dasar, telah terpenuhi; namun ada tiga (3) pelajaran mendasar yang beliau sampaikan kepada saya yang saya ingin bagi kepada teman-teman semua. Untuk setiap entrepreneur yang sukses, ada ratusan yang gagal. Anda bisa gunakan banyak waktu, uang, dan upaya, namun kadang hasilnya tidak langsung terlihat. Kegigihan adalah sebuah keahlian khusus. Tetaplah nyalakan semangat (passion), dan jangan pernah berhenti mencoba. Membangun sebuah usaha, berarti mengambil risiko. Menjadi seorang entrepreneur mungkin merupakan risiko karir yang terbesar yang bisa anda ambil. Semua orang mengambil risiko, tetapi entrepreneur yang cerdas mengambil risiko yang terhitung (calculated risk). Oleh sebab itu, learn your business, jadilah pakar dalam industri tersebut, perlihatkan semangat (passion) dalam pekerjaanmu – live and breathe the topic. You can’t be too smart for your own good, jangan pernah takut untuk bertanya, dan jangan pernah malu untuk bertanya “mengapa” karena satu-satunya pertanyaan bodoh adalah pertanyaan yang tidak pernah ditanyakan. Tiga (3) pelajaran mendasar yang saya sebutkan tadi telah mengantar Bapak Sukanto Tanoto sedemikian jauhnya. Saya berharap dapat melanjutkan dengan semangat yang sama untuk kehidupan saya sendiri. Pengalaman yang Ibu Noni Purnomo dan Pak Jusuf Kalla akan bagikan kepada kita sangat berharga. Mari kita gunakan kesempatan ini untuk mendengar, belajar dan menjalankan di masa yang akan datang. Terima kasih untuk perhatian Ibu, Bapak dan teman-teman semua. Do you know that both Jokowi and Jusuf Kalla (JK) used to be entrepreneurs before becoming President and Vice President of the 4th most populated countries in the world? Both Jokowi and JK spoke at the Tanoto Entrepreneurship Series sponsored by Sukanto Tanoto much earlier than the announcement that they will be running as President and Vice President elect for Indonesia supported by PDIP, Nasdem, Hanura, PKB. Jokowi spoke on 8 July 2013 in Tanoto Entrepreneurship Series (Click here for the Video), exactly 1 year and 1 day before the presidential election in Indonesia. At that point, he spoke alongside with Ibu Mooryati Soedibyo , the founder of Mustika Ratu, who’s a well respected woman in the society and used to have a stint in politic as well as Wakil Ketua MPR during 2004 – 2009. During the encounter with Jokowi, in 2013, he spoke convincingly in front of over 200 students that he did not envision himself running for President, however, after 1 year, the situation changed and there he was, standing in front of many baliho and GBK, pointing at number 2 with his famous one liner shout-out – “salam dua jari”. He was given the mandate by Ketua Umum of PDIP, Ibu Megawati Soekarnoputri, to represent the coalition to run for President alongside Jusuf Kalla, more widely known as JK. JK served as Vice President for Indonesia from 2004 to 2009 and held his last post as Ketua PMI (Head of Red Cross for Indonesia). A coincidence it is that both Jokowi and JK spoke at the Tanoto Entrepreneurship Series. JK spoke a couple of months before Jokowi on 30 April 2013 (Click here for the video). No one in the wildest mind including the students who have filled up the FEUI auditorium to listen to the respected entrepreneurs speak their minds and share their stories would have thought that these two would one day become the President and Vice President of Indonesia. However, it is in my belief that these two entrepreneurs, who will run the fourth most populated country and the largest Muslim country in the world, will bring prosperity to Indoneisa. Both Jokowi and JK will continue to have entrepreneurship mindset and blood as they believe in similar values, one of which is to never give up and “just do it”. Jokowi shared during his speech that Indonesia’s transportation system needs to be changed drastically, while Indonesia had the idea of monorail and MRT since about 14 / 24 years before Malaysia came up with the idea, Malaysia currently have two systems running, while Indonesia does not have a single system running. As Governor of DKI Jakarta in July 2013, Jokowi shared that there are 400 new cars each day and 1400 motorcycles each day, so a transformation needs to be done and he reminded everyone in the audience the importance of doing rather than just planning. JK, on other hand, had 35 years of experience in business and 10 years of experience in politics. He believes that as an entrepreneur, his spirit of just do it allows him to be successful. His father who only finished school till third grade was able to do export import business with no English. So his drive came from the fact that as long as you focus in whatever you do, and continue to do what you believe him, you will be successful. Both Jokowi and JK shared very strong values which is important to ensure that they run the country in the most efficient manner. Because of their experiences in the past and their drive to run the country well, I believe that we will see a better Indonesia going ahead – Indonesia Hebat! Sukanto Tanoto is a successful entrepreneur today, having businesses that have a global reach with manufacturing operations in Indonesia, China and Brazil. Even though he is a successful entrepreneur now, the spirit of entrepreneurship in him never dies and will never die. We all know that a business or a new venture is at its most unstable period during its infancy stage. That is why people often say that the start of a business is the most difficult process and as long as they are able to pass that stage, the future of the business should be relatively easier. Well, that is true to a certain extent. However, the truth is, the later stages of a business development is no where easier than the initial stages. Let’s take a positive example that a business start-up is fortunate enough to have a smooth beginning, everything running well and operations began within the desired timeline. On top of that, profits are generating at a rate that puts smile on shareholders’ faces. Within months, we break even (that is, very positive example). However, yes you may take a short break and indulge in this happiness, maybe show-off a little bit to the friends and family around you. But sadly, reality may not allow you to take such a holiday for a prolonged period of time. The responsibility for business continuity and sustainability is resting on your shoulder! The later stages of a business development is complex. There will be a lot more issues and problems that will arise from your business if you do not make proper preparations beforehand. This matter is made worse when human nature such as complacency and greed sets in. That is why it is important to always have a reality check whenever a new milestone is achieved. Different stages of business development requires different mindset and methodologies to run the business. Sukanto Tanoto once shared his idea on Entrepreneurship in the later stage of a business development. In any initial stage, entrepreneurship begins with survival in mind – how the business will survive. In this phase, persistence and unyielding spirit is the key to success. In the next stage, growth and expansion of the business are expected. This is also the phase where the business model has been established and the next emphasis will be on process improvement, establishing good governance and finding out best practices through the application of continuous improvement (or kaizen). Lastly, we have what we call new opportunities for entrepreneurship. In this phase, each company or business group is unique and has a different approach. There are business groups that will remain in the same industry but venture to other markets that was previously untapped. There are also other business groups that may choose to work on the same market, but take advantages of opportunities in other industries. The challenge is on how an entrepreneur can remain constantly on the ball, constantly seeking for new improvements to push for breakthroughs and never running dry of their drive and passion. Since Sukanto Tanoto was young, he knew the importance of “getting along with the public”. Although Kerinci is located in a rather remote place, Sukanto Tanoto has to handle the relationship between him and the local people well so as to build the world’s best pulp and paper mill there. He tried his best to help the local people overcome their difficulties in life, find jobs, improve their standards of living and enhance their capacity to support themselves. “Good for the people, good for the countries in which we operate, and good for the company”, this management philosophy emerged from such a background. “After we built the mill, we considered assisting farmers with their production. Natural fertilizer is suitable for the land, so we taught the farmers how to raise cattle, and then utilize the fertilizer. Without being there in person, it would not be possible to conceptualize such a plan. Who would think that to develop large-scale operations, one would need to teach others how to raise cattle?” No matter where Sukanto Tanoto set up his operations, he would consider the well-being of the local people as one important part of the development of his enterprise. In order to raise the income levels of the local people, they set up a dedicated training center in the community where their mill is located, provided training for the nearby farmers for free, and taught them advanced production techniques. They also formulated and implemented many community development plans at the same time, including the integrated farming system, community fiber project, support for small and medium enterprises, vocational training and education aid. Besides, they bore the responsibility of building roads and bridges, supplying power and water, medical care, promoting culture and providing other infrastructure for the community. Only when something benefits the local people and benefits the country or region, will it benefit the company, and the company could pursue the harmonious development of man, enterprise and nature in a sustainable way. It is through the “three-benefit” principle that Sukanto Tanoto has discovered the successful model for sustainable development. Under the guidance of the “three-benefit” principle, all of RGE’s business groups make sure that they practice corporate social responsibility (CSR) in their respective operations, and fulfill their social responsibility for environment protection and social work. After Sukanto Tanoto returned to China to invest, he would return to survey his hometown every year. Every time when he came back, he would observe carefully the living conditions of the local people, especially the development of the local community. He would always enquire if there were any effective public welfare projects, and he always considered doing something for his hometown. 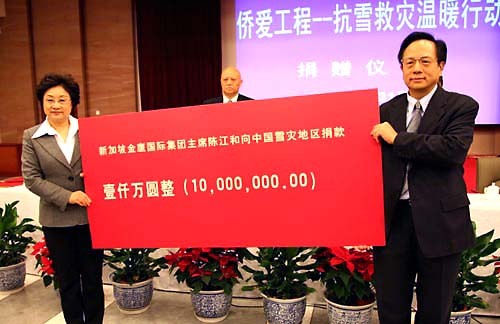 So far, he has donated a total of RMB 200 million to education, empowerment, culture, disaster relief and other public affairs. Sukanto Tanoto has won many praises and awards but in the face of these honors, Sukanto Tanoto remains down to earth. “These honors are only an affirmation of our efforts for so many years. What we feel more is the responsibility we should bear. One’s success requires a certain opportunity. There are lots of clever people in the world, but if they don’t have good opportunities, it is hard for them to become successful. Therefore, after we become successful, we should take out some money to do some significant things to the society and repay the society”, he said.